Police in southern Afghanistan have arrested 10 men in connection with an acid attack on schoolgirls earlier this month, officials say. The men are all Taleban insurgents and some have confessed to taking part in the attack, the authorities say. 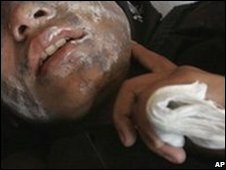 Several girls received severe burns when acid was thrown in their faces on 12 November in Kandahar city. The Taleban denied involvement in the attack, which brought condemnation from around the world. President Hamid Karzai has called for those involved to be arrested and publicly executed. Deputy Interior Minister Gen Mohammad Daud said the men had been arrested in recent days. "The attack was the work of the Taleban and we have not finalised our investigation," Gen Daud told reporters in Kandahar. Gen Daud said the men were Afghans who had travelled from Pakistan. "They were led by the Taleban," he said. "They were taking orders from the other side of the border from those who are leading terrorist attacks in Kandahar." Kandahar Governor Rahmatullah Raufi said the attackers had been paid up to $2,000 (£1,300) by the Taleban to carry out the attack. He did not say how many of the men had confessed. The men's names were not disclosed and they were not shown to reporters. 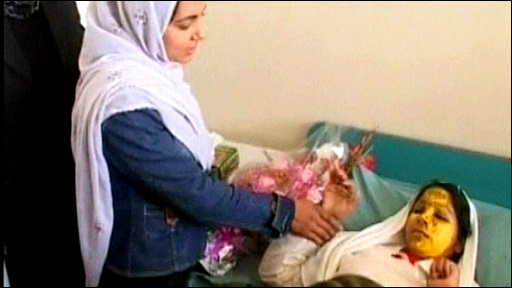 At least 15 schoolgirls and female teachers had acid sprayed at them by two men on a motorcycle near the Mirwais Nika Girls High School in Kandahar. Officials say the attackers used a toy gun to spray the acid and fled as soon as people came to the assistance of the girls. Most of the victims suffered severe burns and at least one of them will have to have her face and neck reconstructed by plastic surgery. Some of the girls were wearing Islamic burkas or veils which provided them with some protection. The attack shocked ordinary Afghans. Correspondents say it is likely to have been carried out by those opposed to the education of women. The former Taleban government, which was ousted in 2001, banned girls from attending school. A spokesman for the movement denied having anything to do with the attack when it took place two weeks ago. But the BBC's Sanjoy Majumder in Kabul says many Afghans blame the Taleban for continued arson attacks on girls' schools. Only two million girls attend school in Afghanistan, with many conservative families still preferring to keep them at home despite a government push to encourage female education, he says. Hundreds of schools - and students - have been attacked by insurgents in recent years.